Ranger stations were the highlights of the day. The first station was three miles into my morning walk. I loaded up on my first water in 18 miles, and I came across a young group of fire fighters willing to pose for a photo. The next ranger station was spaced out another 18 miles ahead, with no water inbetween. Fortunately, it's been downright chilly out here at high altitude this week so I'm not drinking desert volumes. The only hiker I passed all day was a girl named Fish Nugget. We criss-crossed a couple times before walking together for the last 8 miles. She grew up out West, has a crop of unique experiences from living on an eco-farm in Missouri, and she inspired me to make it to that ranger station in time for Snickers. The app I use, Guthook's PCT, has a comment section under the points of interest. 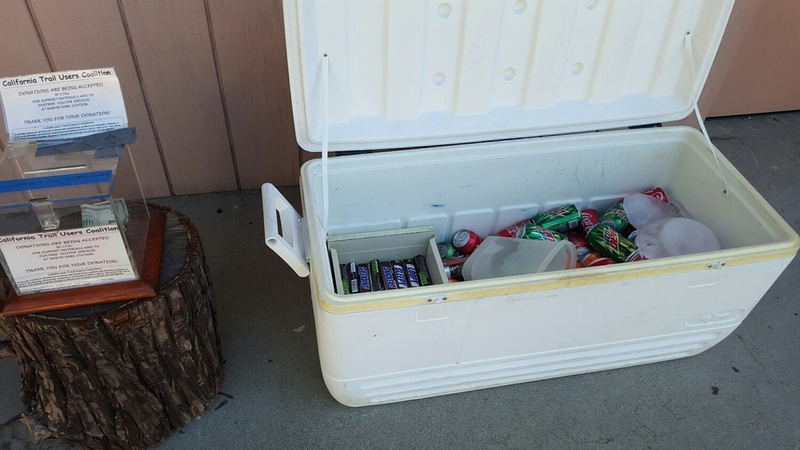 And on May 12, someone posted that a guy at the ranger station sells snickers and soda out of a cooler until 7 pm. We were about 8 miles out when we discovered this. But with less than 3 hours until 7pm, it would be no easy task. I'm not sure I would've made it in time on my own. We hauled ***. And pulled within 3 miles at the top of the final hour. Somehow we made it just minutes before 7. But there was no cooler or car in sight. Until, a hiker showed us the way to the magic cooler. Sure enough, a man appeared at 7pm to take it all away. But not before I bought three snickers and two sodas, for dinner.